So, what is new on the German cigarette advertising front? Only three weeks ago (see post 23 Jan 2012) I reported on advertising for Pall Mall cigarettes in Munich involving beautiful young people being poisoned. 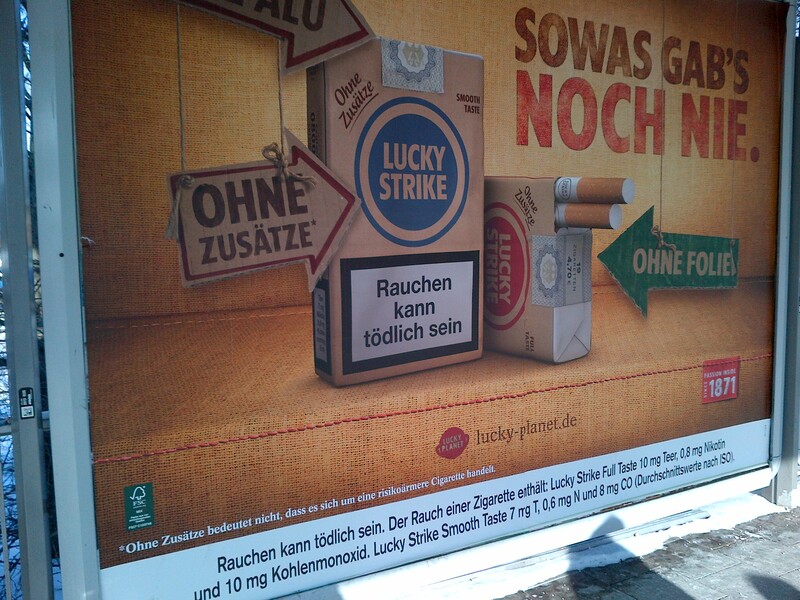 This time, on the exact same advertising hoarding, I found Lucky Strike brand demonstrating its environmental credentials. (Both brands incidentally are owned by the same American and British producers.) Again, notwithstanding that these products are toxic and cause known chronic diseases, Lucky Strike’s marketing people seem to think that packing them in recycled or sustainably sourced cardboard without aluminium foil is a worth shouting about.